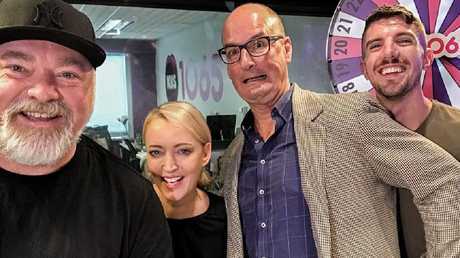 David Koch in studio with Kyle and Jackie O and KIIS FM newsreader, Brooklyn Ross. 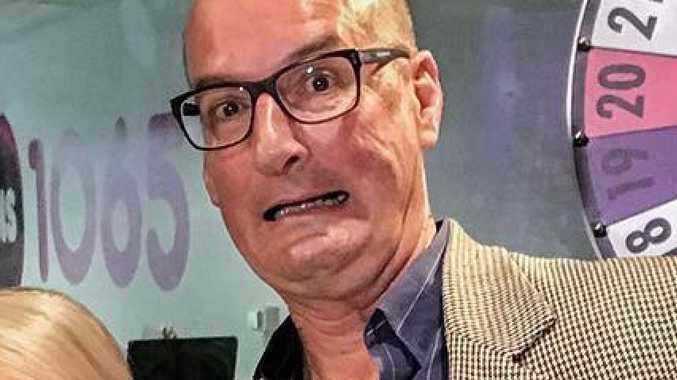 DAVID "Kochie" Koch has opened up about his fiery interview with Senator Pauline Hanson and revealed why one of her comments tipped him "over the edge". 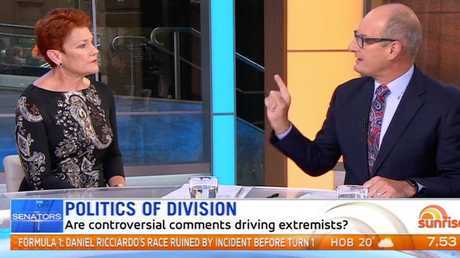 Koch and Ms Hanson had a heated exchange on Sunrise on Monday, with the Channel 7 host accusing the One Nation politician of empowering white supremacists like the one accused of carrying out last Friday's terror attack in New Zealand. Some viewers criticised Koch for his harsh interview style, labelling him a "bully" and calling for him to be sacked. They also accused the program of being hypocritical as it had given Ms Hanson a platform for years. David Koch challenged One Nation leader Pauline Hanson over her anti-Muslim rhetoric. Koch addressed the controversial interview on KIIS FM's Kyle and Jackie O this morning and explained why he was so fired up on Monday morning. 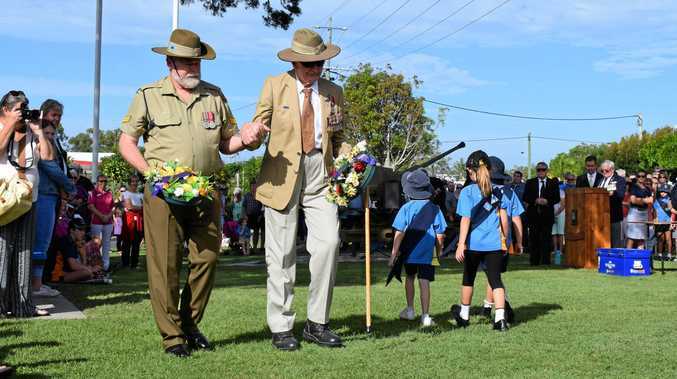 "I'm a bit too passionate about this because I do work with Muslim youth workers in western Sydney," he said. "When politicians talk and they pit Australians against Muslims and the scaremongering, these kids deal with it on the street. They fear for their safety. "What happened in New Zealand just really got to me because we're a society now that's becoming a bit dangerous." Defending his aggressive line of questioning, Koch said, "Pauline's had a lot worse in parliament, she's the leader of a major political party. I asked her to justify why she's so anti-Muslim." During the Sunrise exchange, Ms Hanson accused Koch of not understanding how parts of the community really felt about Muslims, saying, "Go out to Fairfield and out to these other areas. Go and ask the Lebanese Christians what's happened to their country. They'll tell you exactly, and they're in fear of the same thing happening here". Koch fired back, "I actually have a youth centre (Koch Centre for Youth and Learning) in those areas and know exactly what's happening out there." "I don't think you actually know what the hell is happening," Ms Hanson said. It was this comment, Koch says, made him lose his cool. "That sort of tipped me over the edge," he said on KIIS FM. "When she said I wouldn't know, I did go a bit too hard and I accept that. I'm passionate about it, and I've been trolled all week, which is fine." He also defended Hanson appearing regularly on Sunrise, saying, "I've had my kids take me on all the time, 'Why give her a platform?' And I said, 'Because she represents a big part of our population'. "It's a serious political party, and I would rather talk to her and point out when she's leading us all astray or not telling the truth or talking fiction rather than fact rather than the whole discussion go underground." In the KIIS FM interview, Koch again accused Ms Hanson of stirring up anti-Muslim sentiment and said her actions were dangerous. "Politicians don't understand the power of their words, particularly in an election campaign," the Sunrise co-host said. "It's from the playbook that the Romans started back in ancient times: You build somebody up that looks different to you, you make people hate them and then everyone feels more secure in re-electing you. "We've just got to get rid of it because Australia, we are so compassionate. We are so understanding. We're inclusive. We're the best model in the world. Let's not bugger it up."